The calm before the storm ~ Journal of a dreamer. 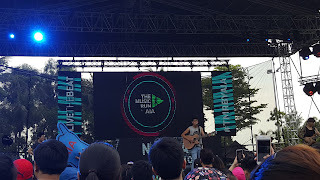 The Music Run last Saturday marked the first time I ever participated in a "paid" run. It wasn't a serious, competitive kind of run, but more of the likes of The Colour Run. Since the company was the main sponsor of this event, I managed to score a pair of free standard tickets to this run, which would otherwise have cost $60 per ticket. I went there with Girly since Grumpy Cat wasn't interested in it. The whole run was really very fun and good. I spotted quite a number of colleagues helping out in the event and made some small talks with them. One of the main highlights of this run was that Nathan Hartono actually came down and performed. Girly was going high over his good voice (and physique) heehee. The run, or rather, walk, of 5 km felt more tiring to me than the actual 4 km plus runs which I had been going with my colleagues in the CBD area, mainly due to the sheer number of people participating in this run, along with the hilly terrains of Sentosa. As this wasn't a serious run, most people ended up walking and I couldn't find the motivation to run as well. ;P The music blared throughout the run was really key in keeping me hyped for this event though. After around 1 hour later, Girly and I reached the finishing line, where the finishers collected their medals. We lounged around on the synthetic grass in front of the stage, before deciding to get food since the event would not end until about 9 pm. Featuring the front and back of the medals. 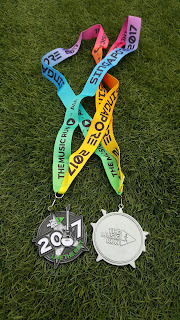 The medals were so pretty! I really like it a lot. Girly and I shared this. 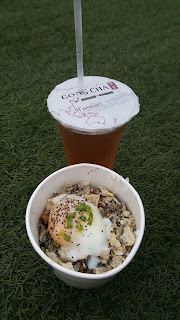 $8 for the miso soya chicken rice topped with fish skin and an onsen egg, and $2 for the Gong Cha. The miso chicken rice was really very good! Food was generally expensive though, so the miso chicken was really among one of the cheapest options around, and the most value-for-money. Spotted this coconut stall selling a coconut shake for $9, seriously LOL. The atmosphere was brought a notch higher when night fell. The whole place became like a club, where catchy music were blaring and runners (more like party-goers now LOL) were just dancing to the music. Among the highlights were definitely the fireworks and the hydro tattoos booth. 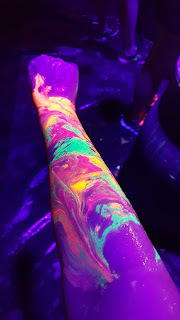 The super chio hydro tattoo that glows in the dark. The queue was crazily long for this, but it was also quite cooling since it was night time already. Thankfully me and Girly didn't queue for this in the afternoon. 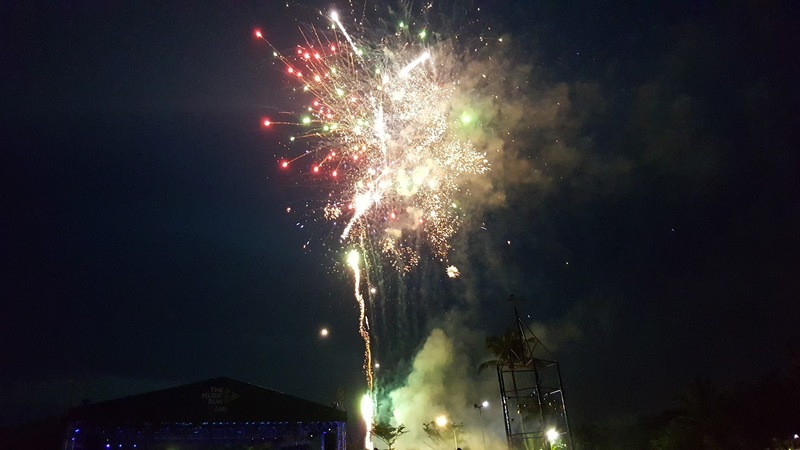 The event ended at around 9 pm, but the shuttle buses that ferried us back to Vivo City arrived timely, hence we didn't have to wait that long to go back to mainland Singapore. Since today is a public holiday, yesterday felt a lot like a Friday to us (for most working people too I'm sure). However, given that it was a Tuesday as well, Grumpy Cat and I were hoping that that the queue at Hamburg Steak Keisuke would not be as long as what we had seen on a particular weekend evening. As luck would have it, even though both of us only left office at around 6.15 pm, and reached the place at 6.30 pm, the queue was only 1/4 the length of the queue we had seen on the previous Saturday evening before the last. Thankfully, we waited for only 15 minutes before we were shown to our seats. 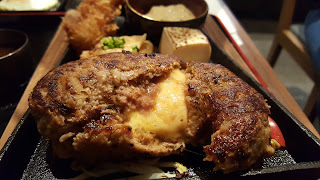 Since this restaurant only sold 2 main items, we went for the more obvious choice of a triple cheese hamburg steak, which costs $20.80++, but includes free flow of salad and eggs. After placing our orders, we went straight for the salad bar and eggs. Thankfully we were seated just right in front of the bar LOL. This tasted good, although a bit salty, probably due to the triple cheese lol. But in all honesty, I was more stoked for the salads and eggs, so by the time the steak came, I was pretty stuffed already and nearly didn't finish my hamburg steak LOL. ._.